Home / Sports / UAAP: Will Molde, Carlos return to UP for final playing year? UP’s Isa Molde (center) and Tots Carlos (right) along with setter Ayel Estranero listen to head coach Godfrey Okumu. Arvin Lim, ABS-CBN Sports. MANILA – University of the Philippines stalwarts Isa Molde and Tots Carlos are still unsure if they will return to play in their final seasons of eligibility for the Lady Maroons. Carlos and Molde, UP’s top hitters since bursting into the scenes as rookies in Season 78, gave no certain answer when asked about their fifth playing year on Sunday, after the Lady Maroons were ousted from the Final 4 race. “Hindi ko po alam. Hindi ko po alam. No comment na lang, we’ll see,” said Carlos, who averages 15.15 points per game for UP in Season 81. 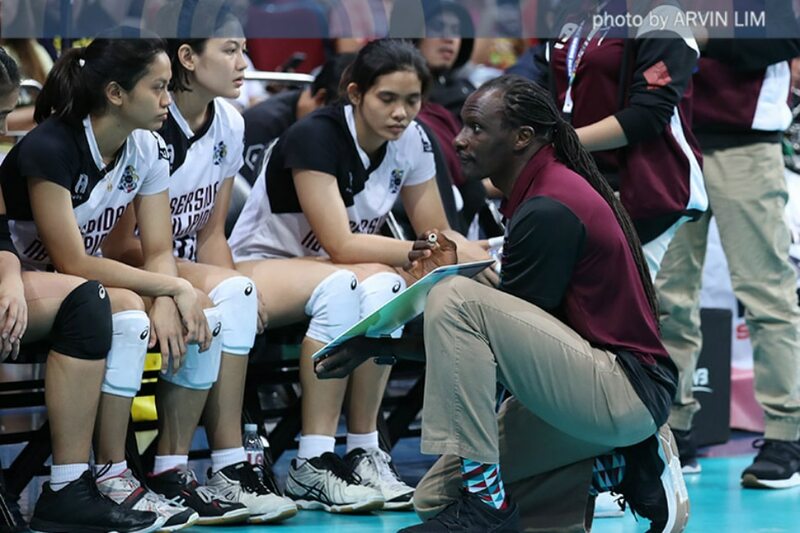 Tipped to be a Finals contender in Season 81, the Lady Maroons instead missed out on the Final 4 entirely after suffering a brutal five-set loss to National University at the Mall of Asia Arena. Carlos had 18 points in the defeat, while Molde was limited to 9 points, though she also had 21 digs and 7 receptions. The loss had dropped UP to 6-7 in the women’s volleyball tournament, making it impossible for them to catch up to Far Eastern University and University of Santo Tomas in the race for the last two spots in the semifinals. Instead, their defeat allowed the Lady Tamaraws and the Golden Tigresses to punch their Final 4 tickets. Rather than dwell on their loss, Molde and Carlos instead focused on ending their season on the right note. They still have one more game in their schedule — a showdown with the woeful Adamson Lady Falcons on April 27. “Siguro yung last game na yun, siguro para sa mga tapos na ng fifth year, and siguro i-dedicate namin sa kanila yung game na yun,” said Molde. “Gusto namin manalo, para at least, winning morale pa rin kami at the end of the season,” said Carlos, for her part.